She was waiting for her aunt to take her to school. An AMBER Alert has been issued for a North Carolina teen who was kidnapped from her front yard early Monday morning. Authorities are going door-to-door searching for missing 13-year-old Hania Noelia Aguilar who was forced into her family's SUV by a man just before 7 a.m. Monday while she waited for her aunt to drive her to school. Police say the man then drove off in the family's green 2002 Ford Expedition, which has South Carolina license plate NWS-984. It has a Clemson sticker on the rear window and peeling paint on the hood. The vehicle was last seen leaving the mobile home community Hania was taken from. An FBI agent read a statement from Hania's mother at a news conference Tuesday. The family is not ready to speak publicly about Hania's disappearance. "Hania's mother asked me to share this message," he said. "'I just want my daughter back with me. I'm here waiting for you, I love you and only care about you. I don't have anything against whoever did this to you. I just want you back." Witnesses said the man who abducted the eighth-grader was wearing a black hoodie and a yellow bandana over his face. The girl's sister, Heylen Perez, said their aunt told Hania not to go outside to start the SUV but she did anyway, WRAL reports. "She just got the keys and started to turn it on," Heylin said. "And somewhere out of nowhere the man came in and took her away." Heylin said she heard Hania scream as she was being snatched from the yard. A neighbor called 911 to report the abduction when one of Hania's family members ran over to get help. 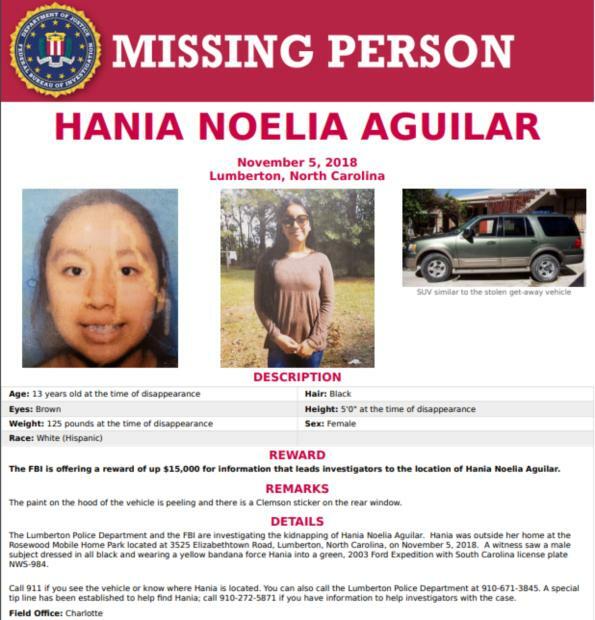 The FBI announced Tuesday that the agency is offering a $15,000 for information that helps locate Hania. "The most important part of our investigation is you, the public," said Andy De La Rocha, a senior FBI agent working Hania's case. "And we need your help." Authorities are following up on over 50 leads in an effort to locate Hania and the man who took her, the FBI said Monday night. "I want for him to remember that he is a son, he has a mother, probably sisters," family member Maria Bonilla told ABC11 on Monday. "For him to have a heart. To put his hand on his heart and think about his family if someone would take his mother, sisters or a member of his own family. That's all." Hania Noelia Aguilar is described as a Hispanic female approximately 5 feet tall weighing 126 pounds. She has long black hair brown eyes and braces. She was last seen wearing a blue shirt with flowers and blue jeans. "I cannot stress this enough," said Lumberton Police Chief Michael McNeill. "Every second counts when a child is missing." If you see Hania or the vehicle, please call 911 or contact Sgt. Pete Locklear at the Lumberton Police Department (910) 671-3845 immediately.